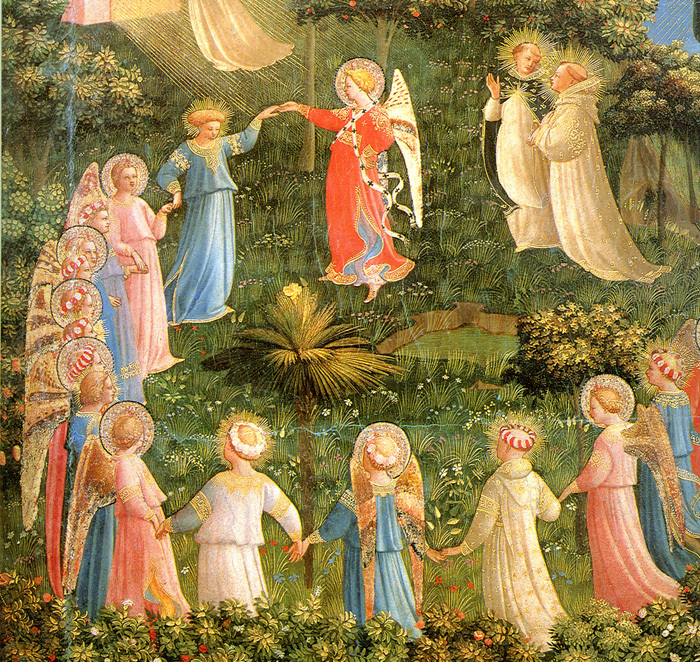 Communal dance is an early Christian image for the divine reality, due in part to a pun on the Greek word, perechoresis. This term (from peri = “around,” and chorein = “make room for,” “contain”) was appropriated in the fourth century to express the Trinitarian unity-in-diversity. Perechoresis implies a shared existence, a being-in-one-another where each Person, while remaining uniquely distinct, penetrates the others as each and all become the subject, not the object, of one another. Each Person contains the others and is contained by them in a shared communion of self-offering and self-surrender. But that continuous self-offering is never a one-way transaction, either one of self-emptying or one of being filled. It is always both at once – giving and receiving – as we ourselves know from our own mutual experience of love at its best. As Jesus said, “losing” yourself and “finding” yourself are equivalent and simultaneous. In giving ourselves away, we receive ourselves back. This may be counterintuitive to the modernist mindset of autonomous individual self-possession, but it is the essence of communion: “a giving of oneself that can only come from the ongoing and endless reception of the other.”[iv] This “being in communion” is explored more fully in Part 1: God is relational. Now here’s the Greek pun: perechoresis also can mean “to dance around,” and the ancient theologians quickly seized on that image as an accessibly concrete description of a complex process. Trinity is a dance, with Creator, Christ and Spirit in a continuous movement of giving and receiving, initiating and responding, weaving and mingling, going out and coming in. And while our attention may focus at times on a particular dancer, we must never lose sight of the larger choreography to which each dancer belongs: the eternal perichoresis of Three in One, One in Three. My mother Elaine knew the joy of the “intensest rendezvous” of perechoresis. She started dancing as a little girl, and as a teenager in the 1920’s she taught dance to younger children for ten cents a lesson. While studying at Northwestern she took workshops in Chicago with some of the great pioneers of modern dance, Doris Humphrey and José Limón. 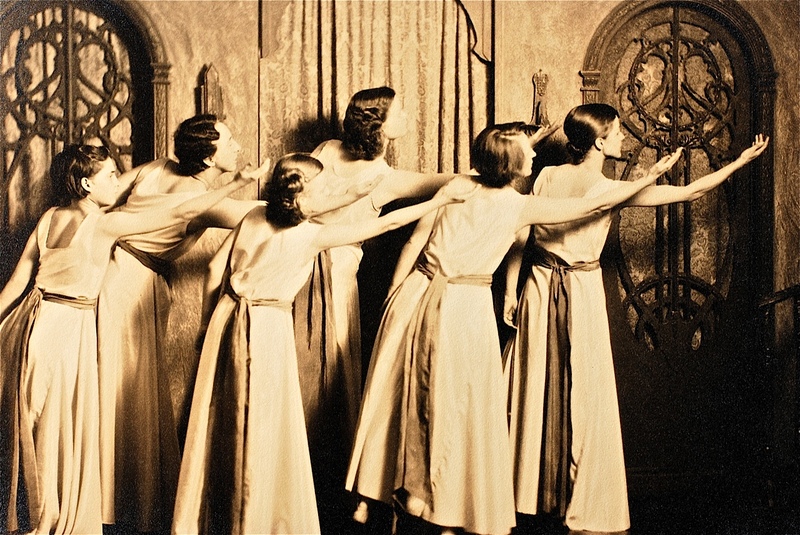 Her teachers encouraged her to apply to Martha Graham’s company. But then she met my father, and a career in dance was set aside for a more domestic life. I owe my own existence to that sacrificial act. Still, she remained a dancer in her heart, and later in life became a great advocate of sacred dance. Whatever I learned from her about the divine dimensions of “dancing around,” of giving yourself over to the cosmic “Love that moves the sun and all the other stars,”[vi] remains a vital part of my theological education. There are no spectators in the Trinitarian dance, which is always extending outward to draw us and all creation into its motions. As Jürgen Moltmann said, “to know God means to participate in the fullness of the divine life.”[vii] It’s not a matter of our trying to imitate the relational being of the loving, dancing God, as if we were inferior knock-offs of the real thing. God wants us to become ourselves the real thing. 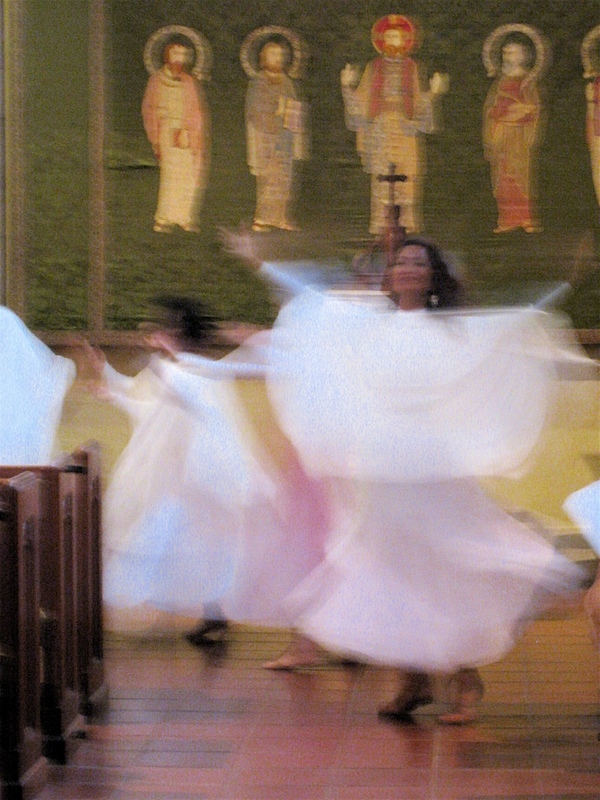 God wants to gather us into the divine perechoresis as full participants in the endless offering and receiving, pouring out and being filled, which is the dance of God and the life of heaven. And while our dance with God has its mystical, mysterious, transcendent dimensions, it is also very concrete and specific to our historical life on this earth, in this present time. As Miroslav Volf has said, “The Trinity is our social program.”[viii] We are called to make God not just an inner experience but a public truth. When Love’s dance becomes our way of being in the world – as believers, as church – the Trinity is no longer just doctrine. It is a practice, begetting justice, peace, joy, kindness, compassion, reconciliation, holiness, humility, wisdom, healing and countless other gifts. My mother was still dancing in her nineties, mostly in the gentle motions of Tai Chi. A year before her death at 96, she was asked to lead a dance prayer in her retirement community’s chapel. It was no longer easy for her to stand, so she performed the prayer seated, while the elderly congregation echoed her gestures with their own frail bodies. The prayer was Daniel Schutte’s well-known anthem, “Here I am, Lord.”[xi] In this video you can only see Elaine, but I’m pretty sure she was dancing with the whole company of heaven.